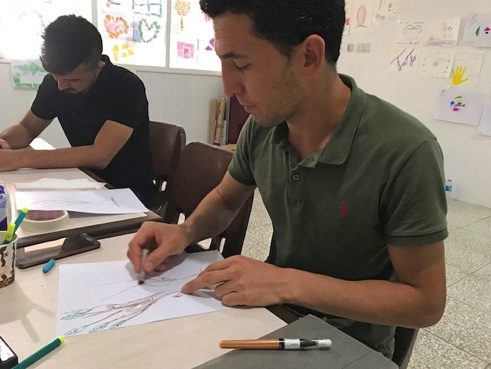 Partly thanks to your financial support, we are able to report on the first training Art Therapy & Trauma that took place from 27 through 31 May 2018 in Duhok, Iraqi Kurdistan. 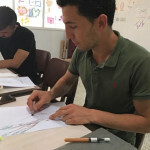 This training is an introduction to Art Therapy. 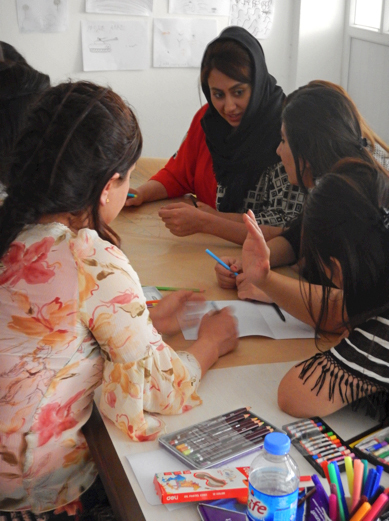 All participants started to work with visual materials and learned by doing how they could apply Art Therapy in delivering aid. 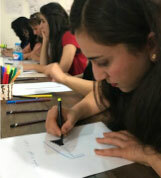 The participants are curious about the materials: crayons, felt-tip pens, clay and oil pastels. Some know exactly what they want to use, others are still looking for the right colour. One of the assignments is to draw an as ‘ugly’ picture as possible. With lots of movement and intensity images with dark colours emerge. 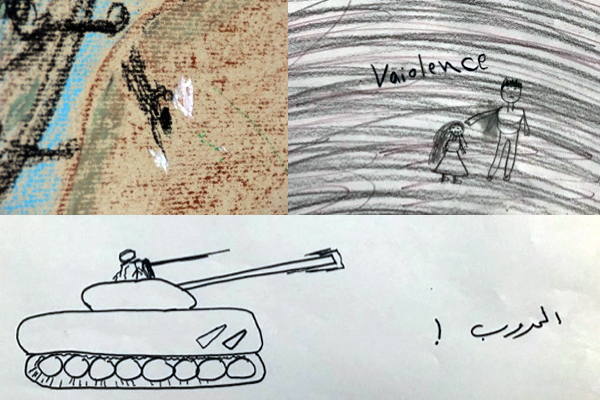 Despite it’s first day of the training some participants are already drawing very personal images: of places and people that are no longer there, of abuse, violence, camps and tanks. One of the men briefly explains about his work (a tank): “I’m only 26 years old, but I have already lived through four wars”. 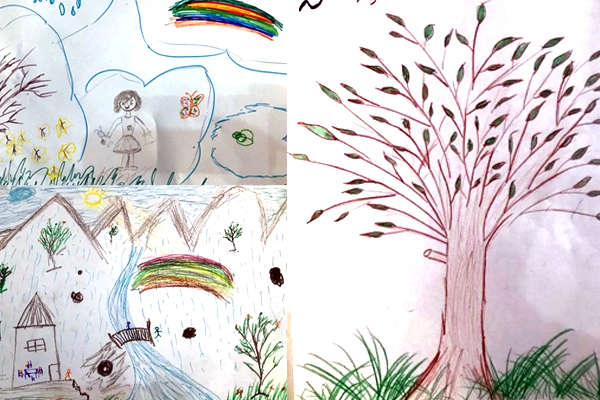 When asked to draw a picture as ‘beautiful’ as possible, colourful images with lots of nature – mountains, flourishing trees, water and rain – emerge. Also families are drawn colourfully. 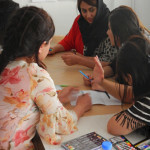 The participants are eager to learn and want to gain as much experience as possible. They use their very best efforts, both in individual assignments as well as in group assignments. They like to use all materials, but for many of them the favourite material is clay, as they have never worked with it before. 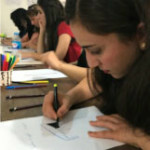 Many participants have hardly been educated in creative subjects. Soon they come up with assignments they can apply in their own day-to-day work. Gradually, there is room for coping with the war violence the participants themselves have had to endure. This way, “taking care of the caretakers” became an important part of the training. 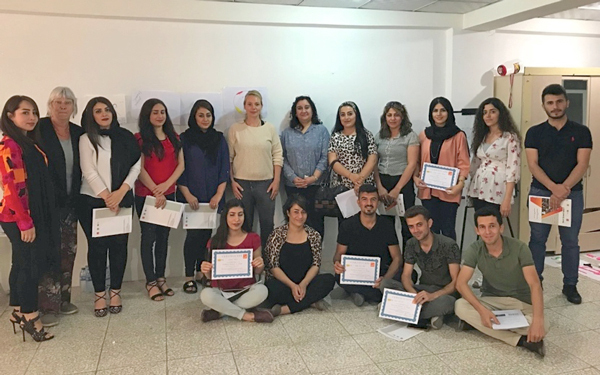 All participants have a difficult task in their day-to-day work and in their everyday life as there is still little safety and trust. The last assignment of the training is: “make the cover of your own book – it is written by you and it is about you. Draw a front page with a title and write something about the content of the book and the author (you) on the back”. In silence, the participants work very concentrated. Each one of them shows their cover and explains to a greater or smaller extent about their work: about dreams that do not come true, about plans for the future that have to be changed, about wanting to leave Iraq. And about hope, that lessons are learned from the past, about willing to portray their own history. A very positive evaluation and the award of a certificate conclude the training. All participations hope for a second training. “This training was also therapy for ourselves. To cope, to reduce stress and to recharge. And to learn how to apply new means to communicate with our clients. Experiences and emotions can also be shared without words”. If possible (dependent on the political situation), a second training will take place in October / November 2018. Seminars will then also be held at the universities of Duhok and Erbil. This training was financed partly by the IONA FOUNDATION. Also on behalf of the participants and the organizations they work for we would like to thank you again for your financial support.